Nearly one hundred scientists, engineers, and managers from about 20 institutes of 12 countries were present at the Herschel/SPIRE Consortium meeting held at the Rutherford-Appleton Laboratory (RAL), UK, from October 7 to 8, 2009. Professor Maohai Huang of the National Astronomical Observatories of the Chinese Academy of Sciences (NAOC) attended the meeting as the lead of cooperation between SPIRE and NAOC. This was the first NAOC attendance of SPIRE meeting as a Co-investigator institute since it signed an agreement to participate in Herschel/SPIRE routine operations in June this year. Progress of the Performance Verification (PV) phase and the Science Demonstration phase (SDP) of SPIRE were reported during the meeting. Since Herschel was launched in May science and technical staffs of SPIRE Instrument Control Center (ICC), including Chinese members, have been working hard, often overtime, to overcome various difficulties, and have accomplished most PV phase tasks. Test results have shown that main aspects of SPIRE performance are excellent, with better sensitivity being than expected. The first batch of mapping data of SDP observations was of such high quality that European Space Agency took them as public relation materials (see figure). SPIRE ICC Manager Ms. Tanya Lim made a special point in her talk during the meeting to praise highly NAOC engineers Bo Li and Jingjing Li for their hard programming and critical contribution. She claimed to be “the happiest person on earth” when she had heard that the collaboration agreement between NAOC and SPIRE had been signed. Ms. Lim also expressed her appreciation that NAOC Ph.D. student Sheng Chen was able to solve some recurring and troubling technical problems when he visited RAL this past summer. After the general sessions NAOC representative for the first time attended the SPIRE management level meeting (Co-I Meeting), providing input and having suggestions accepted on issues such as new Science Team membership approval, publication policy of first generation of papers based on SD data, and resource allocation for the next year etc., and generally exercise NAOC Co-I’s rights. Starting from the following few months waves of high quality Herschel data will become reality. In order for Chinese scientists to use Herschel better and prepare for more Chinese members in the Science Team, Prof. Maohai Huang have discussed with the coordinators of the Special Astronomical Groups (in areas of high red-shift galaxies, near-by galaxies, star formation, interstellar matter, evolved stars, and solar system) in order to understand special membership policies and obtain relevant materials. 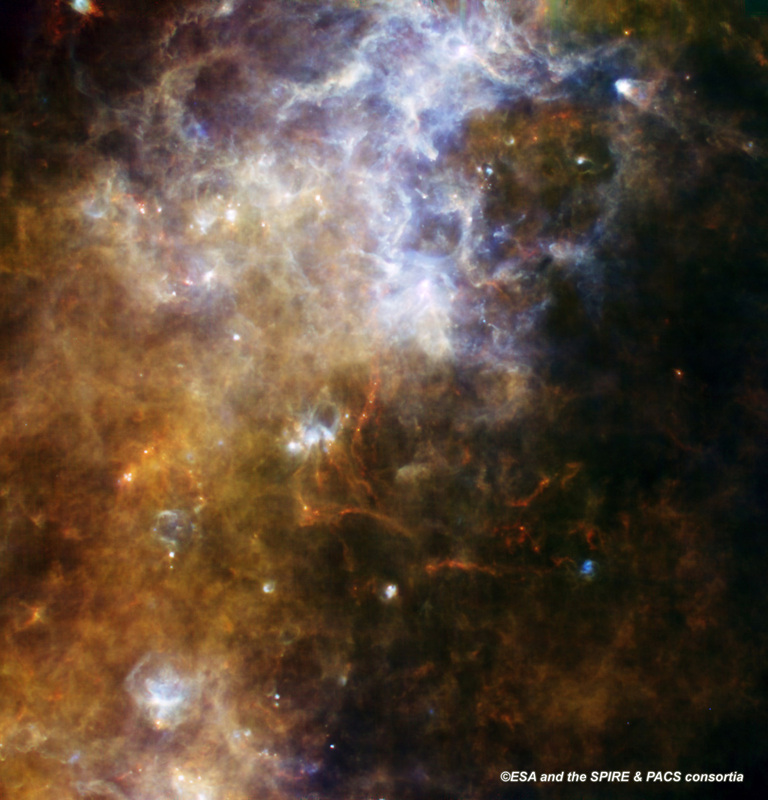 Figure caption: PACS and SPIRE, primary instrument onboard Herschel, successfully made parallel mapping of a 2 degree by 2 degree area near the Southern Cross on Sept. 3, 2009, and obtained excellent result in just 6 hours of observing. This observation was part of the Hi-GAL galactic survey program which NAOC astronomers are part of. This color image was made using 6 bands of infrared data in 70-500 micron wavelengths. With arcsecond-level resolution it reveals complex structure of a lot of cold dust clouds that have never seen before.